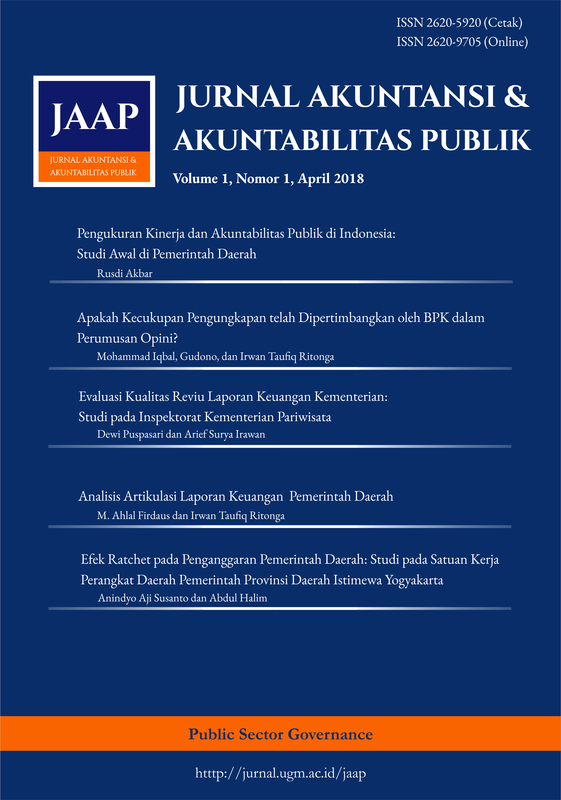 Jurnal Akuntansi dan Akuntabilitas Publik (JAAP) is an academic journal published semiannually by Public Sector Governance, Laboratory of Accounting Department, Faculty of Economics and Business Universitas Gadjah Mada. JAAP aims to provide an interactive forum as a linkage between academic world and practice in accounting and public accountability. JAAP holds a wide range of critical thoughts and ideas as well as empirical studies on accounting and public accountability. The study area includes organizational governance, accountability, accounting, and performance measurement in public organizations. Apakah Kecukupan Pengungkapan telah Dipertimbangkan oleh Badan Pemeriksa Keuangan dalam Perumusan Opini?